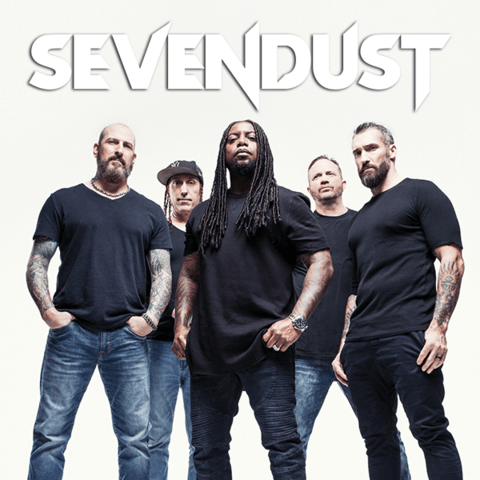 Sevendust's John Connolly: "We Decided To Reboot And Hire A Producer"
That’s exactly what these five musicians do every time they get in the studio or on stage. A trifecta of now-classic gold albums—Sevendust , Home , and Animosity — ignited their journey. Known as an equally intense and unforgettable live force, they’ve consistently packed houses around the world and decimated stages everywhere from Rock on the Range and Woodstock to Ozzfest and Shiprocked! 2015’s Kill The Flaw represented a high watermark. Bowing at #13 on the Billboard Top 200, it scored their highest debut on the respective chart since 2010 and marked their fifth consecutive Top 10 on the Top Rock Albums Chart and third straight Top 3 on the Hard Rock Albums Chart. Most impressively, the lead single “Thank You” garnered a nomination in the category of “Best Metal Performance” at the 2016 GRAMMY®Awards, a career first. At the top of 2017, the boys discussed what would become their next offering. Instead of diving right in, they took advantage of an eight-month writing process, which proved to be a breath of fresh air. I spoke with John Connolly to talk about All I See Is War. Did you guys do anything different with All I See Is War than previous releases? JC: We wrote a lot more. We usually come to the party with 30 new songs to choose from. This time we had 50-60 songs this time. You have time off, and you’re excited about writing new songs. Every time you get a chance to make new music we’re going to. We ask ourselves, do we kind of stay right to what we are, or do we explore something new? There’s always that moment you go what new territory can we get ourselves into? In 20 years from the first record to the last record, I never would have thought in 1997 if you would tell me we’d be releasing a record like Travelers and Bonfires, I’d be saying you’re out of your mind. We’re not an acoustic band you’re crazy. People ask me, is it the heaviest record you’ve made? I’m like, is that what’s important? I want to make the best Sevendust album. If it’s heavy, that’s cool. There’s plenty of heavy music on this album. Didn’t you work with Michael “Elvis” Baskette with Projected too? JC: I’ve been a massive fan of Elvis’s since Incubus and STP going way back. He produced some of the earliest Stone Temple Pilots. Tone wise all good stuff. For us, it was such a welcome. One of the things is we haven’t worked with a producer for a while. The last time we worked with an actual producer, not take anything away from Mike Ferretti, we stepped into that role for sure and helped us out. It was 2008, and it’s been a while., almost ten years, so we figured all right, let’s hit the reboot and let’s get someone. Elvis is one of those every note, and I mean every note, you think I’m exaggerating when I say this, but every note goes under the microscope. All of the drums, bass, guitars too, he doesn’t miss anything, and that’s what I love about him. We may miss some stuff. He’s not missing anything. He has a picture, you know, with our pictures and hopefully, we can come together and make that vision. Did you tell Elvis what sound you wanted to create with All I See Is War? JC: He’s been a fan since he heard Home. He wanted that impact. He wanted that impact of Home. Animosity, arguably one of our best sounding records, but there’s something about Home that a lot of people, I don’t quite get it, but a lot of people identify with it, and that was his thing. I don’t think it sounds like a Home at all, but I do think it sounds like a hybrid of Home. Do the five of you share songwriting and music ideas or is their specific collaborators? JC: There’s no method to the madness. Never know what combination is going to end up being. That’s the beauty of this. I could have a cool thing; it could be Morgan, it could be whatever. You never know who’s going to have an idea. What’s the meaning of the song Dirty? JC: If you look around, no one’s listening or everyone is ready to arm up and duke it out. It would be cool to get back to a place where we’re listening, and personally, I prefer that. We’re the type of band that speaks what’s on our mind. We don’t write about Dragons or some other silly stuff. It’s sad because my mom, she even looked at the lyrics and said, that’s depressing. I said Mom it’s true. Humanity is ready to tear itself apart. Did you use any leftover Projected songs for All I See Is War? JC: Ten Years Gone was a song leftover from a Sevendust album we used for Projected. It was leftover from the Alpha recording session. The only reason I know that is I saw date stamp on it. I was stoked. That was the bridge to connecting those two records. It was precisely ten years when I saw the time stamp. Are you going to do a Projected tour? JC: I hope so. It’s probably the most frustrating thing and trying to coordinate everyone’s schedules. Alter Bridge and Tremonti are on a crazy push right now; they’re doing studio, tour, studio, tour. It’s like we don’t have a spare moment to do one. What’s the tour cycle going to be for Sevendust for All I See Is War? JC: A good solid 18 months, two years during the tour. We’re going to surface a couple of songs on the radio and YouTube. We’ve got a label on board this time, a producer and I can’t believe it! Thanks, Andrew for all of your support!